Local media outrage over Jacksonville blast is just “cashing in”on a successful project. Just as day follows night, so spring follows winter. According to French footballer, actor and part-time philosopher Eric Cantona, “seagulls follow the trawler because they think sardines will be thrown into the sea”. Equally predictable – and rather less cryptic than Monsieur Cantona – local media complaints about collateral damage in the wake of a successful tower block implosion. 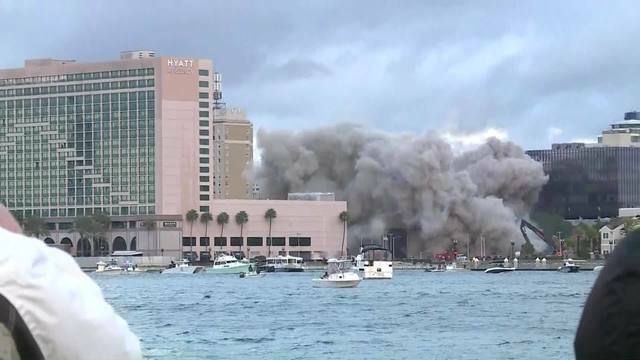 So the “news” that a “gas line and dozens of windows were damaged” during the Old City Hall Annex Implosion in Downtown Jacksonville should come as a surprise to no-one within the demolition community, least of all to the team that carried out the blast. According to local media reports, windows needed replacing in the neighbouring Blackstone building and at the Hyatt Regency hotel. As demolition folks have come to expect, this news was not balanced by an account of the precision of the blast, the fact that the building fell within its own footprint as planned, that the blast was carried out safely, or that the materials arising from the blast will be recycled.